I've been craving freshly made waffles for a last few months and so finally put in an order for a waffle iron from Cuisinart. 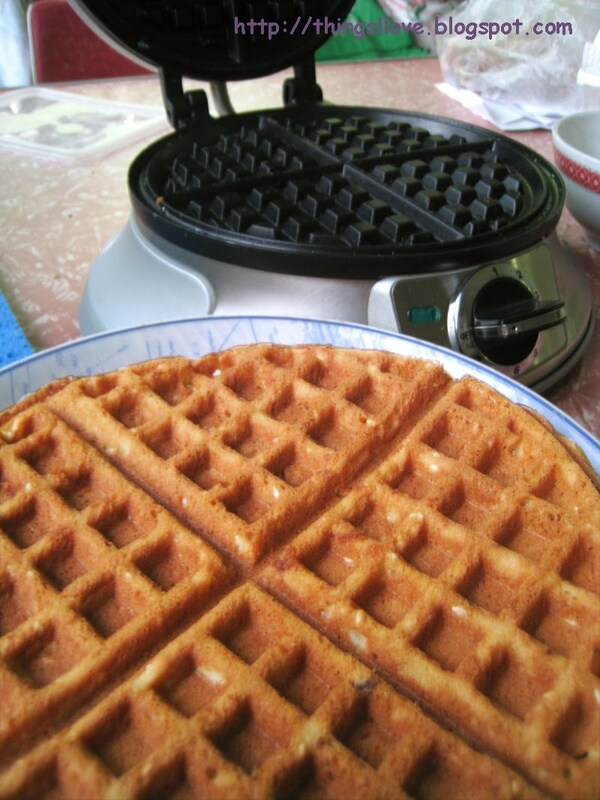 It finally arrived the other day and I put it up for a test drive with a recipe for Vietnamese waffles. Vietnamese waffles are traditionally made with coconut milk rather than butter for a lovely soft texture with a sweet creamy taste. Put all dry (first six ingredients) ingredients into a bowl. Use the whisk to combine the egg yolk, coconut milk, butter, and extract of choice. Beat the egg whites until firm peaks form. Add the liquid ingredients to the dry ingredients and use a spatula to gently fold the flour in. Once the flour has been incorporated, gently fold in the egg whites. If the resulting batter looks lumpy, that's okay. Expect the batter to be thick. Avoid over-stirring or the waffles may end up too chewy. 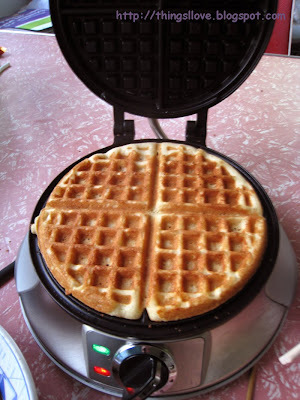 Set aside batter while the waffle iron is on pre-heat mode. Use a ladle to pour enough batter over oiled and pre-heated waffle iron, spreading the batter with the ladles so it fills all the grooves. 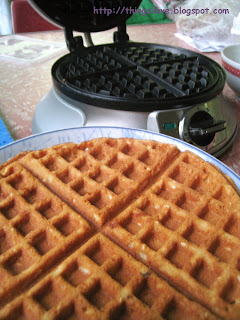 The waffle iron produced lovely waffles, not too thick and soft when hot out of the iron but crisps up when left to cool. I found that setting 3 were more than enough for my liking for the browning level of my waffles . They tasted divine and my cravings are now satiated. Clean up was a cinch with the non-stick surface and no spill grooves of the waffle iron - a few quick wipes with a damp towel and I was done. If you also have a waffle craving, look into investing in this gadget as it is guaranteed to give you many joyous waffle making and eating moments. I'm going to try other recipes next time I make waffles to see which I like best. What's your favourite waffle/pancake flavour? Cuisinart waffle iron - RRP A$99.95 at David Jones and good kitchen stores. Wow - I want one! I asked David Jones just last week if they sold any waffle makers & they said NO ! :( Costco is the only place I've seen a waffle maker on sale, & my boyfriend thought it was on the small side - so we didn't purchase. I've been on the look out ever since. I'll have to hunt this one out now - Thanks! There's plenty in DJs, they were sold out and I put in an order with them. Took 2 weeks to arrive but they ordered extra and there is stock now. Wait of 20% electricals - that's when I got mine.